Did you think the 5.3-inch Samsung Galaxy Note was too big? How about the Galaxy Note 2 with its 5.5-inch display. It doesn’t really matter because Huawei’s Ascend Mate is the new king of “phablets”, the horribly named class of handhelds that are part phone and part tablet. Huawei earns the crown (for now) because the Ascend Mate has a whopping 6.1-inch screen. Take that, Samsung! Huawei officially introduced the new handset on Monday at the International Consumer Electronics Show. Due to a large, 4050 mAh battery the Ascend Mate should run for two full days on a single charge. As a frame of reference, I easily get through a full day with my slightly smaller Galaxy Note 2 and it has a 3100 mAh battery. Unlike my Note 2, however, the Ascend Mate has no stylus. Instead, the 6.1-inch slab uses a 1280 x 720 resolution touchscreen made with Gorilla Glass like most smartphones today. Unique to the handset however the chip inside: It’s a 1.5 GHz quad-core Hi-Silicon K3V2 with Intel(s intc) graphics processor. A pair of camera sensors — 8 megapixels on the back and 1 on the front — are used for image and video capture as well as video chatting. Google Android 4.1(s goog) is the operating system along with some tweaks to make the device easier to use with a single hand. 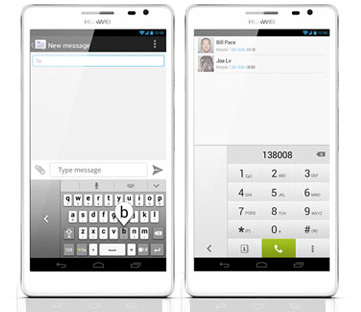 The keyboard and dial pad can be pulled to one corner of the screen, for example. Huawei baked in a few additional features too. The screen can be used while wearing gloves using what the company calls Magic Touch. The Guiding Wizard software overlays POI data on maps using augmented reality. And the Easy Panel quickly pulls up often used applications or utilities. There’s no word on price or availability yet from Huawei, but the device doesn’t support LTE networks, so expect to see it hit other regions before it possibly appears in the U.S. The company could always sell the phone unlocked in the U.S. however, where it works on the HSPA+ networks of AT&T(t) and T-Mobile. its not about big a device is, it’s about what more it can do! Thanks for the catch William. I’ll fix in the post!